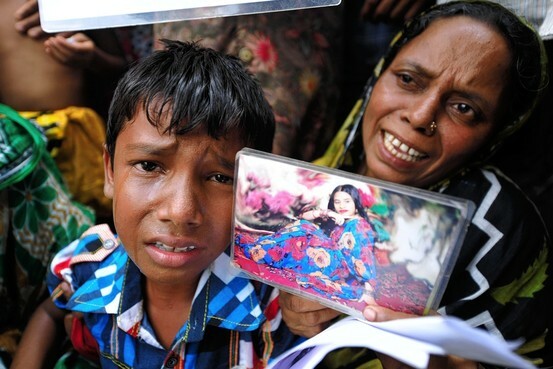 Dhaka, April 24, 2015 (Alochonaa): The Rana Plaza disaster on April 24, 2013 received worldwide coverage not only because of the atrocious number of victims (it claimed the lives of 1,133 people), but also due to the global connections of the local industry. Rana Plaza, a place where five factories were located, delivered outfits to many brands and retailers in North America and Europe (such as H&M, Inditex, C&A, Loblaw and Primark). Worldwide attention was attracted as both domestic and international stakeholders were stitched together in the same place. All the actors – the factory owners, the government, buyers, workers and consumers – are all part of the chain of this industry. The disaster depicts the degree of exploitation that the Ready-Made Garment (RMG) industry is premised upon. It can be substantiated through, for example, revealing the everyday struggles and the forms of social-psychological coercion that the workers are subjected to. Two years have passed since the disaster took place, yet still a number of planned initiatives have not been executed and others are progressing slowly. 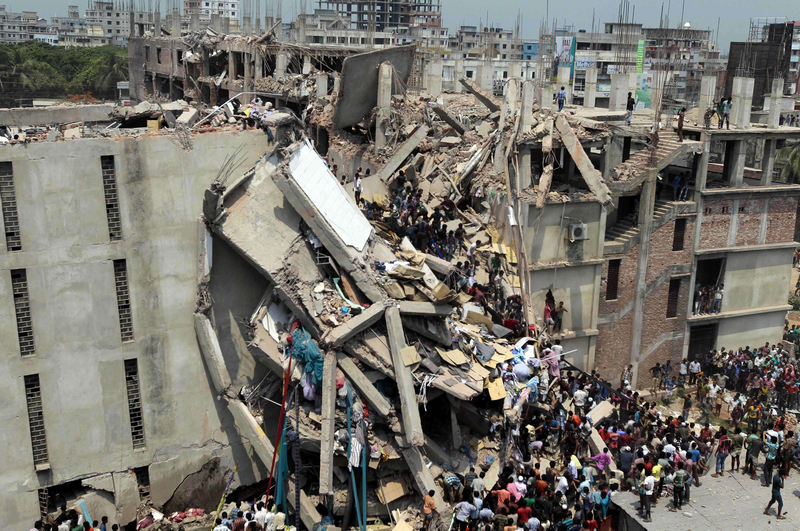 The core aim of this article is not to evaluate the progress of post-Rana Plaza initiatives. Rather, the intention here is to illustrate how Rana Plaza demonstrates the disjuncture between the trade-led development discourses on the one hand, and the daily experiences of the workers on the other. The collapse of Rana Plaza exposed two broad structural crises; unjust global economic order and the failure of local governance. There currently exists a “consensus” between a dominant group of actors in civil society who consistently deny the legitimacy of the workers’ grievances and protests in favour of alternative explanations, such as that they are conspiracies (organized by others) to destabilize the RMG. The social and economic effects of the RMG are not conceived and experienced according to the ‘public transcript’ (employment in the RMG is claimed to be a win-win situation and development blessing). Rather, the everyday struggles reveal the suffering and deprivations workers endure, and progressive narratives are contested among (and by) the workers themselves. The workers’ sufferings have originated from factors such as low wages, the absence of adequate and/or lack of enforcement of workplace standards, the denial of their basic rights (including collective bargaining), the creation of unfavourable legal obligations (such as limited provisions for maternity leave), and the denial of basic freedoms and due process in the administration of their employment. The post-Rana Plaza saga discloses the hidden reality concerning the RMG, challenging in the process scholars such as Jeffrey Sachs, who view the RMG industry (or in his words “sweatshops”) as the first rung of the development ladder (and thus as somehow a “natural” and necessary development process). The deceased, missing, physically disabled, injured and traumatised workers of the Rana Plaza reveal the magnitude of their struggles for survival. These testimonies and deep-breathed uncertainty unsettle the common sense assumptions of “development” as broadly shared (and nurtured) by pro-industry civil society actors and the state. After the Rana Plaza disaster we have witnessed a number of visible and hidden protests from the workers themselves. Some of them (family members of the deceased workers) have protested to get their legitimate compensations for the deceased victims, whereas others protested for their living conditions that include a wage and right to a safe workplace.One of the prominent findings of my own research (as a part of my doctoral thesis) revealed that workers were on the whole inclined to support worker protests, and some of them were directly involved in protests. The workers perception and involvement with the protests bears testimony to the fallacy of accepting the rhetoric of win-win situations in trade-led development discourses. However, it should also be noted that the workers’ movement has operated sporadically and failed to act in a unified fashion. This should not be surprising, given the fact that legal protections for workers have been limited and have served to constrict the emergence of worker solidarity to strengthen their struggles. These include the absence of trade unions to secure adequate rights and/or the lack of enforcement of existing rights and the sanctioning of out-sourcing, together with the use of coercive measures such as the Industrial Police. What is also important is that state-civil society relations have been practically non-existent in the governance of the political economy of the RMG sector (a significant number of parliamentarians in Bangladesh are also owners of RMG factories). The liberal notion of civil society doesn’t apply in Bangladesh because the state and elements of civil society are closely aligned. By striving towards maintaining low costs and uninterrupted production, industrialists perceived it to be imperative to develop measures by which workers can be controlled effectively and efficiently, making this one of the core concerns of their framing of the trade and production discourses. In the wider context of the political economy of Bangladesh, the investors and manufacturers have been exempted from specific legal obligations concerning labour rights, such as restricting trade unions within the factory premises in Export Processing Zones (EPZs), preventing the formation of trade unions in non-EPZs by making them subject to the approval of management (e.g. Bangladesh 2006 Labour Act; Article 205, p. 9596) and also indirectly by out-sourcing of production to the ‘third level’ factories (outsourced labour is exempt from any labour protection laws). Such and similar institutional mechanisms serve to consolidate the subordination of worker’s needs to those of industrialists, investors and their organic intellectuals. The various control measures that have been applied by management also include surveillance and intimidation tactics aimed at disempowering the workers and undermining the possibility of worker solidarity to develop as a counter-force. As Cain highlighted, relations between the law and capital are reciprocal because “just as law is given its form by capital, capital is given its form by laws that enable its accumulation, disposition, alienation, and so on” (Cain, 1994, p. 39). The structural dynamics inherent in capitalist social relations of production constitute a crisis for the workers, both from the perspective of their sufferings, and from that of their lack of the capacity to foment and maintain effective movements and organizational forms in order to mitigate against their sufferings. For example, it was the crisis of overproduction in industrialised countries in the late 1960s and early 1970s, which pushed capitalists towards new ways of production, and the transfer of production facilities in the textile industry towards countries with cheap labour such as Bangladesh was part of capital’s strategy to overcome this crisis. More importantly, a tight focus on the structural dynamics of capitalism would have indicated that the extensive downward pressure on working conditions and wages in Bangladesh is not necessarily attributable only to greedy Bangladeshi capitalists, but is also the consequence of relentless capitalist competition in the global garment industry in which different countries in Asia are fiercely competing with each other over which country offers the most attractive location for exporters. It is important to articulate some other facts about Rana Plaza and recent initiatives. For example the debate over total number of victims of Rana Plaza tragedy is still not over. Out of the 365 workers who were initially not traced, a total of 206 workers have so far been identified through DNA test. Another 85 workers remain unidentified. Overall, 159 workers are claimed to be missing and claims are being verified by the government (Ministry of Labour and Employment, GoB, as of February 01, 2015). In order to provide support for the victims, the initial estimated requirements for a trust fund was US$40 million but the revised estimate was reduced to US$30 million. As of April 21, there is a shortfall of US$9 million (CPD, April 21, 2015). For the compensation of the deceased and injured workers, Bangladesh Taka (BDT) 127 crore has been deposited under the Prime Minister of Bangladesh’s relief fund. However, as of April 09, 2015 only BDT 22 crore 93 lac has been disbursed (Action Aid Bangladesh, April 23, 2015). The National Tripartite Plan of Action (NTPA) on Fire, Electrical Safety and Physical Integrity (NAP) in the RMG sector has been set up by the government and facilitated by the International Labour Organisation to undertake safety related activities (related to buildings). Other initiatives, such as the “Alliance” of buyers and retailers of North American countries, and the “Bangladesh Accord” comprising several global brands and retailers of the European Union markets, have also been working on fire and building and worker’s safety. More than 1250 factories (out of 1400) have now been inspected by the Accord. 52605 different kinds of problems have been identified in these factories but only 782 (1.5 per cent) have so far been corrected. Another 10248 (19.5 per cent) are awaiting verification and the remaining 80 per cent are still present (Accord, 2015). The Alliance has inspected all of its 648 factories and finalized 300 corrective action plans (CAPs) to date. NTPA, with the support of the ILO, has plans to inspect about 1500 factories. Bangladesh University of Engineering and Technology (BUET) has inspected 500 factories while the rest of the factories are to be inspected by two private sector companies. The NTPA initiative is currently facing a number of difficulties in conducting the inspection since out of the 600 factories that have received utilisation declaration (UD) certification for export, 450 factories have wrong addresses listed with the BGMEA/BKMEA and another 500 factories are non-existent. Post-Rana Plaza development shows the interests of different actors are not aligned and it is not “win-win” for all in export-led development. Global retailers are working on readjusting their outsourcing and local manufacturers are still searching for the breathing space for their continual production and capital accumulation. Government in a position to rearranging its current development philosophy where industry development comes first and democratic values come second as they attempt to appease investors and local manufacturers in the second largest RMG exporter in the world. The workers are the so-called beneficiaries of trickling down glocal (global and local) initiatives such as the Alliance, Accord or the NTPA. Yet nothing is being done to address the structural injustice and false premise of the development myth. The daily realities of the workers and their protests and struggles against all that is stacked against them is an indication of the prevalence and resilience of counter- hegemonic forces. The political challenge is, however, complicated by the fact that the state and elements of civil society are (and have been historically) so intertwined. The conditions for the RMG to flourish through labour exploitation have been systematically organised by legislating against labour rights and entitlements. Everybody knows the visible and obvious problems of the workers, but they have intentionally desisted from taking any appropriate measures to redress their sufferings. Rather, governments have resorted to creating the regulatory environment for the RMG sector to flourish and furnished it with the discourse that the workers protests are not genuine expressions of their grievances but, rather, is a conspiracy to destabilise the RMG industry. Rana Plaza exposed a need for a political analysis of civil society struggles in Bangladesh which further requires that we adopt an appropriate lens to theorise these relations rather than apply already established conceptions of civil society. *Dr. Kazi Mahmudur Rahman, an Assistant Professor of the University of Liberal Arts Bangladesh (ULAB) . Dr. Mahmud’s PhD thesis at The University of Queensland exclusively examined Bangladesh textile sector through post-colonial theories. Before joining the ULAB, Dr Mahmud worked many years as a researcher at the Centre for Policy Dialogue (CPD) , Bangladesh’s leading think tank.